Mantsinen has significantly extended its global distribution network over the last few years, and the results of this hard work can be seen in the volume of orders being received and in the positive momentum in the global investment business. The extension of production facilities allows it to considerably increase its production volumes. “The hydraulic port crane we developed is growing in popularity in markets around the world. Entering into new market areas places increasing demands upon our delivery chain, and so it’s a natural step for us to start assembling our machines near the sea because these days we are far more often shipping assembled equipment by sea,” says Mia Mantsinen, the company’s Managing Director. Mantsinen has been known for over 55 years as a developer of terminal logistics for the forestry industry. 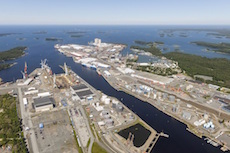 The company is also the wood yard operator for Metsä Fibre’s Äänekoski and Rauma pulp mills. In the 2000s, Mantsinen added a second business unit alongside the service unit. Employing over 150 members of staff, the machinery unit’s product portfolio ranges from heavy hydraulic material handling machinery to port cranes, together with associated attachments and life-cycle services. “We are keeping our main office and product development functions in Liperi, eastern Finland, although this expansion means that other functions could also partially be based in Rauma. However, at the initial phase we are going to focus on the assembly of our products and shipping,” Mia Mantsinen continues. The company has also started a development project at its Liperi production facilities and this will gather speed in 2019 and 2020. Recruitment is part of the daily work at Mantsinen: “We have recruited more than 30 people in Liperi during the past three years, but we plan to proceed more gradually in Rauma,” adds Mia Mantsinen. Mia Mantsinen explains that the first delivery from the new premises is destined for Uruguay, as the company is providing material handling machinery for raw materials logistics to the Montes del Plata pulp mill within the next 12 months. The delivery consists of 12 hydraulic cranes that help ensure that the raw materials logistics for the pulp mill, which is able to produce 1.4 million tonnes of pulp, run well and smoothly.